Do you ever wonder what the one thing is that we all need most? I think I have found it! I have seen so many judgmental people out there. So many short tempered. So much unforgiveness. So many harsh words. And on and on, and all I want to do is scream GRACE at the top of my lungs. I haven't. Yet. Wanna know why? Because I have been that person too. And it makes me sad. And I want to change. Yes, people do things we do not agree with. Yes, people are mean. And petty. And judgmental. But so am I sometimes. And in those times when sin gets the best of me, I pray that someone will show me a little grace. And I pray that I will show someone the same! After all- the one who loves us the most in spite of our sin and wickedness, in spite of our bad decisions, and ugly words and judgmental selves and pettiness and on and on, shows us grace hourly! Minutely! So what's the word for 2014? Other Crew members are sharing their word for their year...take a look! Welcome back! Oh, yes, I have been the one kind of MIA, right?! Sorry- but I knew you would understand. You see, I have been spending a lot of needed quiet, and not so quiet, time with my family. I have also been giving this blog a lot of thought. You see, it takes up a lot of my time and I do not want it to be for nothing. So I have been evaluating, planning and writing. Setting goals, dreaming and more evaluating. More of that to come on Friday! But for now, I want to say thank you for your readership! Thank you for your friendship! Thank you for your messages of encouragement and the kind words you leave here and on my email! They are ALL appreciated more than you can know. 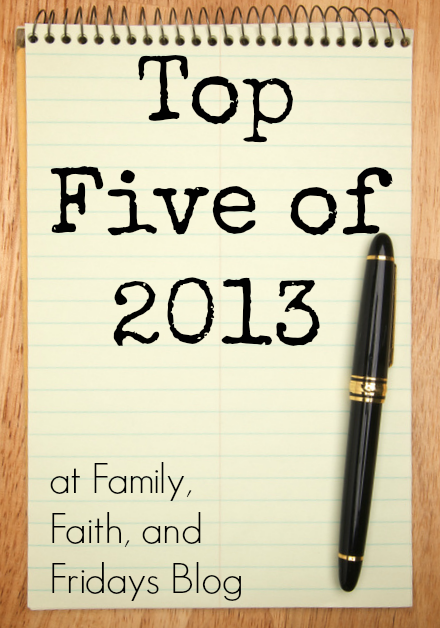 AND, in looking back to see what you like to read here (part of all that evaluation stuff) I wanted to share with you Family, Faith, and Fridays' TOP Five posts for 2013. If you didn't get a chance to read them then, I hope you will now...enjoy! #1 Where Did Modesty Go?- This is actually the most popular post on this blog. Funny, since it almost did not get written because of my fear of offending someone. Just goes to show that when God speaks to you, you should listen! Every. Single. Time! #2 How Sin Rocked Our Week- Boy, this was a hard one! Memories of this week still bring a heaviness to my heart which I cannot explain. #3 Project Organize- The Fabric Stash- Oh, how I had fun with this series. I would do it again, except that there is not much left. haha Threw it all away! This was actually my daughter's brain child and one she still loves. #4 What Are You Wearing?- Another "on my heart" posts! We may not sometimes see it, but there are a lot of people out there still seeking to be modest! #5 TOS Crew Review- EEME- A review! Finally! Did you know that was the whole purpose of starting this blog? Really! In case you haven't noticed, I am a independent reviewer and one of the companies I review for is The Old Schoolhouse Magazine. It has been an amazing journey, one I will be blogging about in January, and I cannot speak more highly of it. This particular company was one of our last reviews of the year and one we continue to work with, even though my review is long done. If you are looking for some fun, Electrical Engineering projects for your kiddos, start here! All my boys love it. This family loves snow. No, really we do! Even here in cold South Dakota where the high tomorrow is suppose to be negative 2. Nope, no typo! NEGATIVE 2! But when I look outside and see the bright white snow, it makes my heart sing. 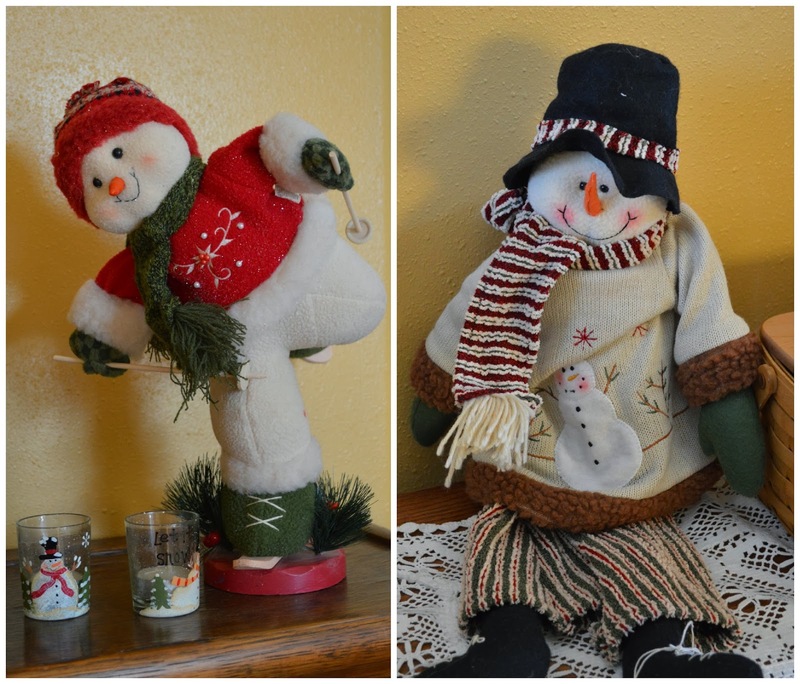 As do snowmen. So here are a few to share with those of you devoid of snow! If that leaves you longing for snow, you are always welcome to visit. I have a feeling ours will be here for a while longer! Have a blessed Christmas, friends! 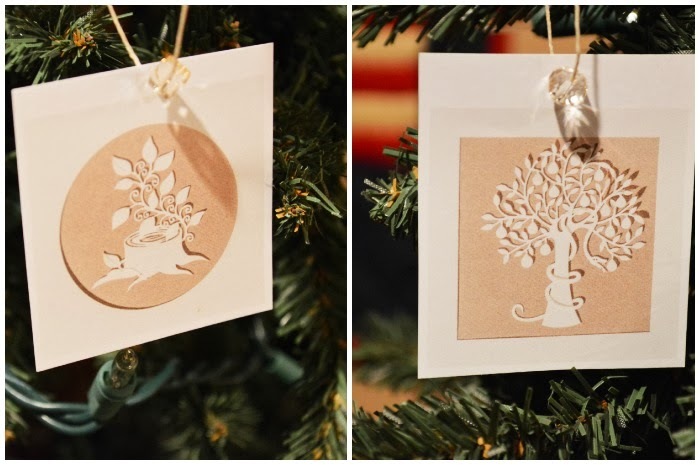 Just like our trees, each has a special memory attached to it and each year when I put them out we talk about those memories...hopefully the kids love it as much as I do. The first and most delicate Nativity was my grandmothers. Actually my step grandmother, which makes it even more special. This amazing lady got an automatic granddaughter (who was 8 and feisty at the time) and treated me like one of her own from the very first time she met me. I spent a lot of special times with her and she never treated me any differently than the other grandchildren. I loved her dearly! When she died my stepfather gifted me with her nativity and it is one of my most treasured possessions. It holds a lot of memories. Want to know something fun - it is from Avon! Really! She sold Avon for years and collected the pieces one by one. I actually saw that they have pieces on Ebay now - I will have to keep that in mind as our angel has lost her head a few times in our moves. This nativity was first given to me by my mom and it is one the kids really like because I do not have a panic attack when they touch it! It is made of some sort of heavy resin and is safe to touch. 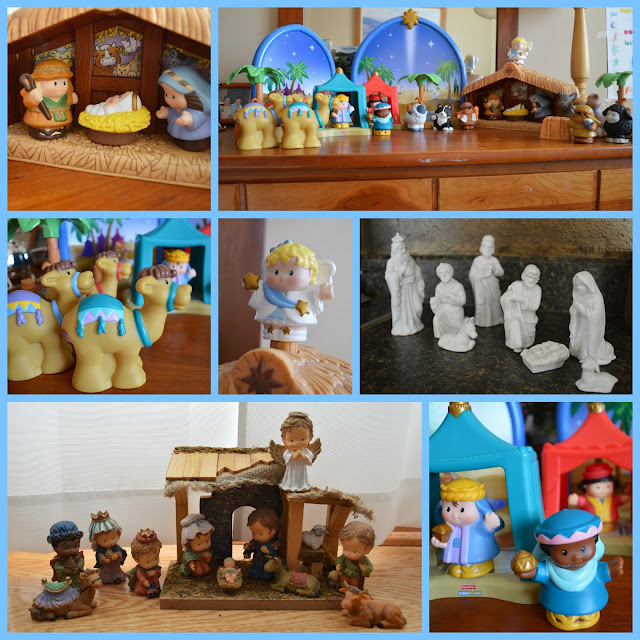 Last year we kept finding all of the pieces rearranged thanks to the then 5 year old. Usually all of the people were crowded around the manger. Makes sense! 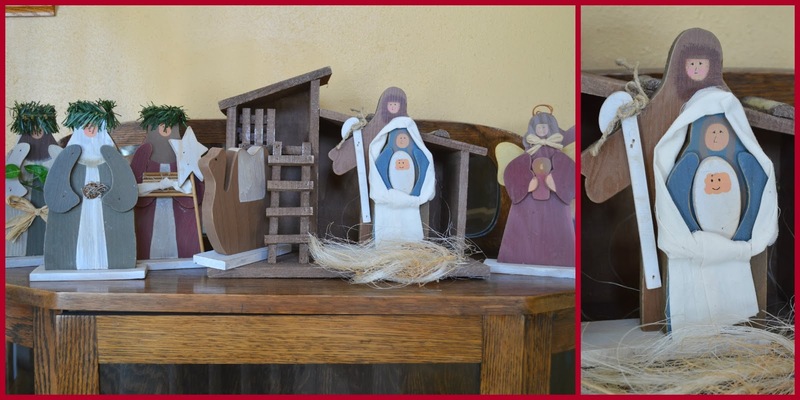 This nativity is one of our newest, given to us by our dear friends who lived in Germany at the time. It is from the Elim Mission in Poland. Each piece is handcrafted and the sales go to help feed Christian families in the area. Some of the pieces have neat back stories like the verse John 3:16 is written on a piece of paper and sewn into every baby Jesus! If you are looking for a child friendly set, this is a great one to have! 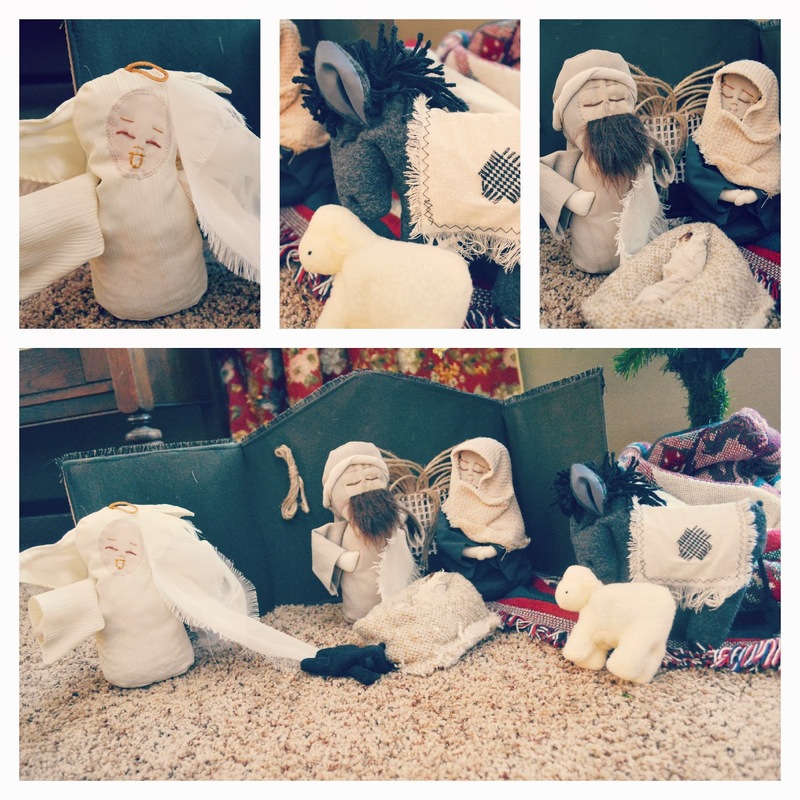 This is our newest nativity that I bought last year. It was hand carved in Guatemala by a local artist there. Someday it will go with our Guat prince, but for now is a reminder to us all of how blessed we are to have him in our family! Just like God adopting us into His family because of His love for us, so too, was CJ adopted into ours. There are more. A glass one here, a ceramic one there. I love them all. It makes me smile to pass by one, or two, in each room and warms my heart to be reminded that Jesus is indeed the reason for our celebration, but more importantly the reason for our lives! May you be blessed this Christmas with the love of God! Are you still following Oh Snap!? Wow, there are some pretty amazing photographers out there. 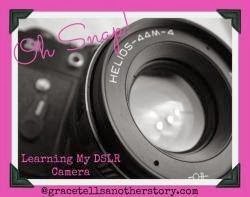 And ones who even read the instruction manuals that came with their cameras...imagine that! I am slowly learning a few things along the way, but admit that I am also waiting for my college girl to come home on Thursday to walk through it all with me. I learn better by doing, how about you? That being said, Ashton will be guest posting for Oh Snap! one more time on Saturday. Hope you will hop over to read what she has to say. I will leave you with a few random pictures I have taken in the past few weeks. The boys were just a little proud of themselves for getting a gift she liked! We have gotten snow the past few days! Someone loves the snow- no matter how cold it is! Since I happen to love books (you knew that already didn't ya?) 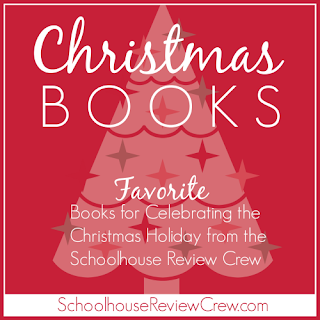 it made perfect sense for our family to collect Christmas books to read for the holiday season. In a perfect world I would have bought one special book each year to add, but hey, who can stop at just one book? Or M&M's...just saying. Anyway, through the years we have added Christmas books to our collection and now even house them in a cute little basket a friend gave us. They go in front of the fireplace at whatever house we are currently in and are there to read the entire month of December. As the kids have gotten older a few more chapter books were added and they tended to read them more on their own. 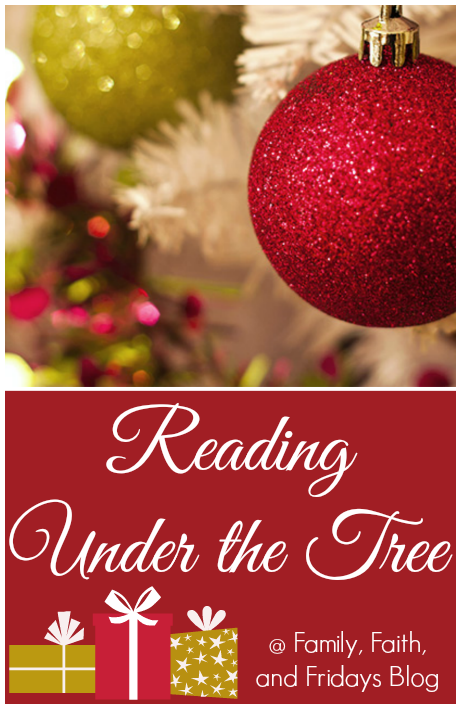 One year we read one book a night, often while lying under the lights of the Christmas tree. (That might have been the year my oldest son wanted to sleep there as well!) Now that we have a younger kiddo back in the mix, I have joyfully gone back to reading the books out loud. Fun memories surround every one of them since some have been around for 19 years! That, by the way, just makes the 19 year old old - not me! Who is Coming to Our House? - The sweetest book EVER! My mom introduced it to us when she taught preschool and the older kiddos in this house can recite it practically. We have two copies of it. It is about the animals preparing a place for Jesus to be born. Make believe completely, but I do not care. I love it! The Story of Christmas - This copy is bilingual and we got it for CJ! Since he has been taking Spanish lessons weekly from his Guatemalan teacher and improves his Spanish daily, I cannot wait to see how well he understands this one this year. Hey, maybe even my accent will sound better, who knows! 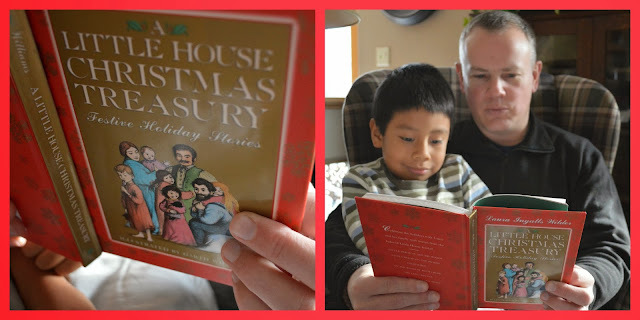 The Little House Christmas Treasury - Got this one a few years ago because I thought we should move on to reading older stories. We never did read it out loud because the girls snuck it read it on their own. Classic stories you will recognized it you are a Little House fan. Skipping Christmas - Yes, this is where Christmas With the Kranks came from. Again, pure silliness, but makes me giggle every year when I read it. If you want a quick read that will put a smile on your face, this little book is it. Plus, it seriously puts all kinds of ideas in my head. Like leaving next year for Christmas and THAT being our gift to each other. You just never know! *Please note, this is an book for adults and NOT for kids! 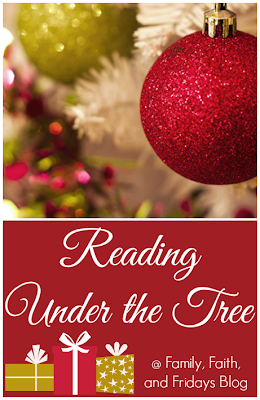 The Jesus Tree, Song of the Stars and God Gave Us Christmas - All just super sweet children's books that further explain the true meaning of Christmas and remind us to refocus our hearts on what is important. We love fun around here but I do feel very strongly about our kids knowing EXACTLY why we choose to celebrate Christmas. It is not just an excuse to give presents! The Christmas Alphabet - This is a simple alphabet book, but that is all that is simple about it! The paper cut out work in it is amazing and has always captured our children's attention at any age. It was given to us many years ago by a dear friend. Jotham's Journey - Last year we tried something a bit different - we picked up this book and read it as an advent "devotional" each night leading up to Christmas. In fictitious story form, it tells the story of a boy who eventually gets to see Jesus. I was not sure about it at first, but even the older kids began asking for it each night and we enjoyed making it a part of our nightly family devotions. This year I picked up a second book by the same author called Tabitha's Travels. I am looking forward to seeing what it will hold. And of course, the true Christmas Story found in the Bible. While we love board books about Jesus' birth, to silly books like Big Bird's Sweet Surprise, to classics like Twas the Night Before Christmas and The Nutcracker, nothing can replace to true story of our Savior's Birth - the most precious story and gift we will ever receive. If you have never read it or if it has just been a while, I would encourage you, dear friend, to start in Luke. May The Lord bless you this Christmas and always! There are a lot of decorations I put up each year that make me smile, but the trees- well, they make me giddy! I am not one for decorating too early. I like my seasons and fall really is my favorite so I try not to rush it, but this year we did put up the trees early. I had to! My college daughter was home for Thanksgiving and I wanted her to be a part of the fun and since she is not returning until the 19th, early it was! First, the family tree. For the first time ever it is not in the den, which has concerned the children greatly. 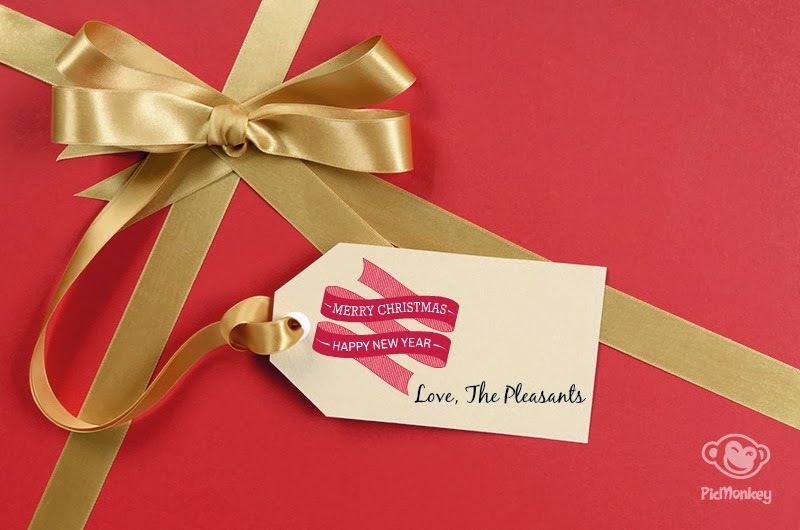 WHERE will the presents go? WHERE will we open gifts? Still to be determined. Then there is the Americana Tree. Hey, we are a military family remember! 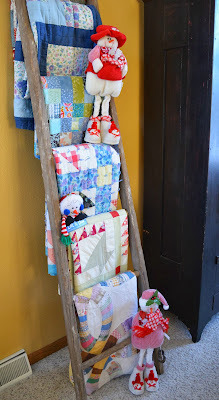 :) There was talk about putting it downstairs in the basement, but I love sharing it with friends and not as many people go down there so I convinced my amazing man it would fit on the stair landing. He is still not convinced but he is humoring me! 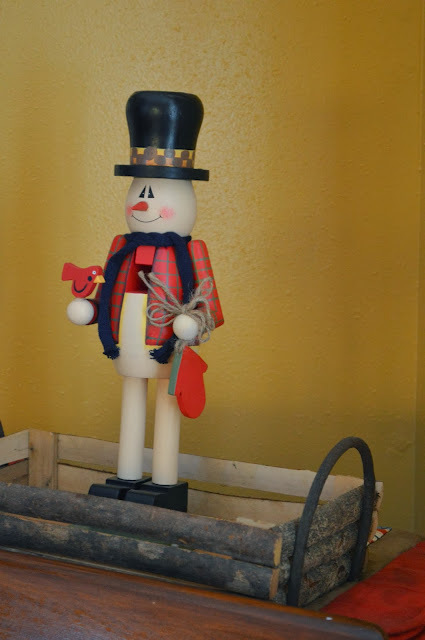 I put all the Nutcrackers under it, but they are usually all over the house by the end of the day thanks to a certain 6 year old! 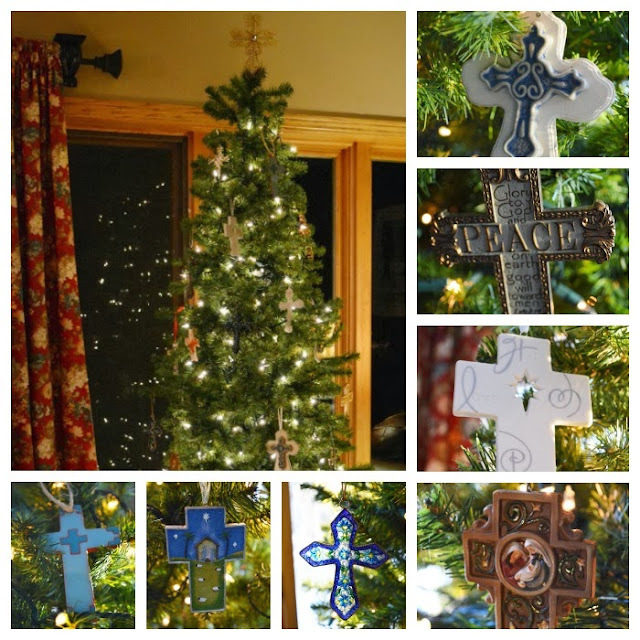 Then there is our Cross Tree. This use to be a little tree but my mom gave us her old tree since she spends Christmas with us anyway and now it is my favorite tree. Thus, it got put in the den this year so I could see it most often. 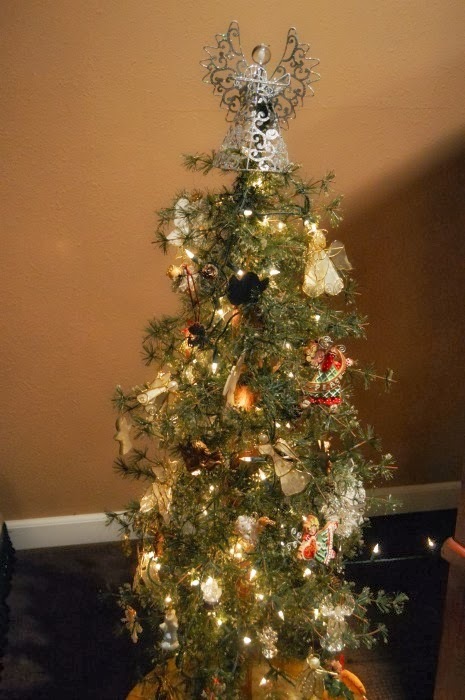 There is still a lot of empty space on it, did you know it is easier to find an ornament of Santa than it is of crosses, just saying, but I love each one and it is a beautiful reminder of the One who gave His life for us and made this holiday even worth celebrating. Then there is our little tree outside. Yes, it is plain. It is a work of art in the making...currently in my head. Rome was not built in a day right? I imagine little birds all over it, maybe cardinals, and plaid bows for my girls, but well, again, Rome was not built in a day! Yes, that is real snow! And then... I told you I liked trees... is our advent tree. Last year it was our angel tree but this year they moved to a new tree because a dear friend sent us a lovely devotional book that has the prettiest ornaments that go with it. So each night when we gather to do devotions we read from this book as well and the boys add a new ornament. I can't wait to see it with all of them on it! Thank you LL!!! Here is the Angel Tree! Not the best picture, but you get the idea. Has anyone else noticed how hard it is to get a good picture of a Christmas Tree? And then there is the children's tree. I actually bought the white one last year because the original tree finally fell apart. Literally, branches falling off. Because we had so many ornaments the older girls decided to put the Disney type ones that grandparents have given them and many of the homemade ones on a separate tree of their own. This year our littlest coned them all into putting it in his room as his official nightlight. I imagine this tree will get slimmer as the kids go off on their own someday and take their ornaments with them, but for now it is filled with fun memories. And two more to end- these are my mother-in-law's, so I cannot take credit for them, but both have been done in honor of my sister-in-law, Lane, who died at age 21. They make me smile and bring back many precious memories whenever I see them. The first- A Beanie Baby Tree! Beanie Bears were very popular the last few years of Lane's life. That was when they were hard to find and people stood in line to get them! I am not sure how it all got started, but Lane began to collect them and then it became a sort of contest to see who could get the latest or most hard to find. Eventually even her nurses and people who worked in the hospital gift shop were in on the fun and I know that they blessed her immensely. I do not think it was ever really about the bears, but about the love that was in one given! My mother-in-law eventually added them all to this tree which gets stored in the attic as is and brought out each year. My kids love looking at all of the bears- any guesses on how many there are? 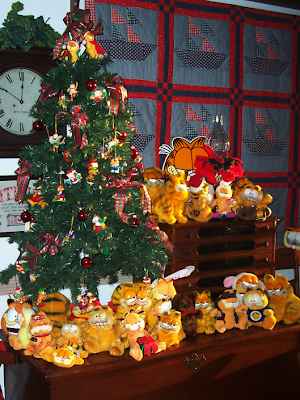 The other thing that Lane loved was Garfield. You know- that silly, orange cat? She even named a stray that adopted her Garfield and eventually Garfields began to roll in as well. So this little tree began because of that! Cute huh? So, while they may not seem very Christmas-y (my made up word, maybe?!) they are filled with love and memories! May your Christmas be filled with love, memories and the promise of a King who was sent to save us all! One minute it is blocks and dress up with the 6 year old. The next it is all things Nerf with the 6th grader. Then high school transcripts and musicals with the 16 year old. The next minute it is college and life plans with the college junior. Mind spinning yet? Sometimes mine does! 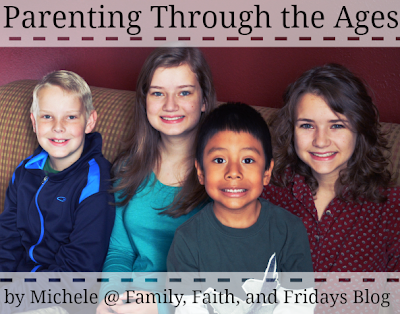 It is a challenge to parent through the ages, but we have found a few tricks that work. Oh Snap! We are back to help you learn!